3 x Wago 221-412 lever nut connectors. 4 x Wago 221-415 lever nut connectors. 6 x Luminus CXM22 Gen3 4000K. 6 x 133mm Passive Pin-fin heatsink (for CLU048/CXM22/Vero 29). 6 x BJB holder for Luminus CXM22. Thermostat wire for DC power. Aluminum L-stock, machined to a smooth rounded end. Sections of 3/4 black rubber hose added to the ends of the L-stock for safety. Heavy copper wire for the hangers. 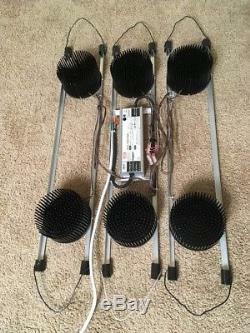 This light was used for a few months but is working perfectly and is in excellent condition. Though fully assembled and ready to rock, this should be considered a kit or "for parts", is intended for advanced hobbyists, and is not a store-bought product. Also, the aluminum frame and wire hangers could probably use a safety upgrade. I put rubber ends on the metal L-stock to help keep the ends from being so dangerous but a better solution would be to add a cross-piece on each end. I don't have time to fix them up so use as is or upgrade as you see fit. Most of the heat sinks do have some bent pins, they arrived this way from the supplier and it doesn't affect their operation. The above being said, this light is has proven itself be extremely effective and is the most efficient type of grow light currently available. I have a limited number of these used lights available and will not be building any new ones. I will be listing a few kits with various combinations of LEDs, reflectors, and drivers. Kit B is Kit A but without the reflectors. 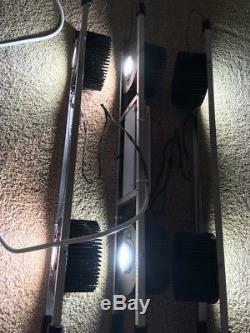 Kit C is Kit A but without the reflectors, with another light module added, and with 4000K instead of 3500K LEDs (4000K is slightly more bluish but both are very neutral and have ideal characteristics for plant growth). Kit C is most optimized for vegetative growth whereas Kits A and B are intended for flowering. For those who may be wondering why I chose to use Luminus and Citizen COBs instead of the more well-known. CREE CXB3590 which has been upending the grow light world, here's a brief explanation: The. Has output efficiency that is basically on par with the. CXB3590, and it sells at less than half the price. CXB3590, and it puts out about 10% more usable light than the. CXB3590 can at the same wattage. Most hobbyists in the know are already using these lesser-known brands because they're a better value and just as high in quality as the CREE. 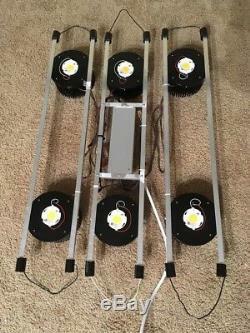 The item "COB Grow Light Kit 6 x Luminus CXM22 + MeanWell HLG-185H-48A, Fully Assembled" is in sale since Sunday, September 30, 2018. This item is in the category "Home & Garden\Yard, Garden & Outdoor Living\Gardening Supplies\Hydroponics & Seed Starting\Grow Light Kits". The seller is "justinld50" and is located in Vista, California. This item can be shipped to United States, Canada, United Kingdom, Denmark, Romania, Slovakia, Bulgaria, Czech republic, Finland, Hungary, Latvia, Lithuania, Malta, Estonia, Australia, Greece, Portugal, Cyprus, Slovenia, Japan, China, Sweden, South Korea, Indonesia, Taiwan, Thailand, Belgium, France, Hong Kong, Ireland, Netherlands, Poland, Spain, Italy, Germany, Austria, Israel, Mexico, New Zealand, Philippines, Singapore, Switzerland, Norway, Saudi arabia, Ukraine, United arab emirates, Qatar, Kuwait, Bahrain, Croatia, Malaysia, Chile, Colombia, Costa rica, Panama, Trinidad and tobago, Guatemala, Honduras, Jamaica, Bahamas.